How can I restrict Users from Inviting others? You are here: Home / Administration / How can I restrict Users from Inviting others? Office Chat allows you to enable/disable Users from sending Invites to others. 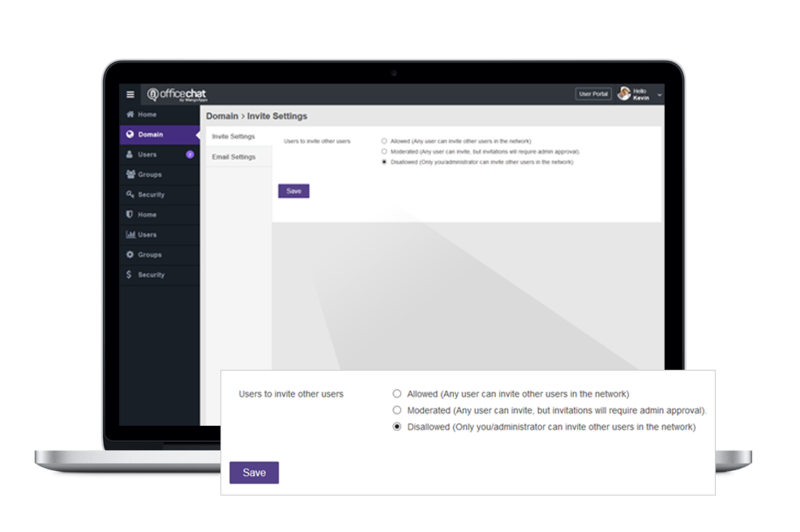 You can control how new users get added to your network. The choices include anyone can invite, anyone can invite but the domain admin needs to approve, lastly only the domain admins can invite. This feature is available on Office Chat Enterprise plan. Keep in mind the “Moderated” option will notify you or any domain admin of new invitation approvals from the admin portal, no notification is given if a domain admin performs the invitation. 4. Once you have selected the desired option, click on ‘Save’ to confirm. Kindly note: These settings do not get applied to signups via Google Apps & SAML providers.